Serendipity Reviews: Wuthering Wednesday on Thursday! I was meant to write this post yesterday, but I wasn't sure how to post it and as has I had been absent from the blogging world for a few days, I didn't want to just jump straight in. So I am doing Wuthering Wednesday on Thursday this week, but it will be Wednesday next week. If you have no idea what I am talking about, then I will explain. 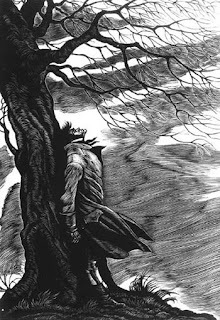 I have joined in with Softdrinks's Wuthering Heights read a long which you will find here. We are reading on average three chapters a week and will talk a little about them each week. So here are my thoughts on chapters 1 to 3 of Wuthering Heights. Now my knowledge of Wuthering Heights before beginning was rather vague. I knew that there were two characters in it called Heathcliff and Cathy and it was a bit of a love story. I also knew it was set on the moors. I also remember the Kate Bush song Wuthering Heights, which is worth a viewing. That was it. Terrible I know. Anyway I picked up my lovely 1933 copy of Wuthering Heights which is in hard back and has been kept for many years in my recently deceased father in law's book collection which has come to live with me. I asked my husband if any of his family had ever actually read it and he thought that they hadn't. Isn't that shocking, to think this book has been read at all since it was purchased in 1933! I am over the moon to be the first to read it. The first three chapters are based on accounts in Lockwood's diary after he takes over as the tenant at Thrushcross Grange. His landlord is Mr Heathcliff and Lockwood decides to pay him a visit. He is not treated well on his visit, yet decides to return the following day. A blizzard occurs the following day and he ends up having to spend the night in the house, much to the disgust of the residents of the house. The housekeeper puts him in a room that is no longer used and Lockwood spends a restless night in there, only to encounter a ghost outside his window upon waking. Lockwood cannot wait to get back to his own property to forget the eventful night that has passed. The first chapter had me lost. I wasn't expecting a third party to be the narrator. His name is Lockwood and he has to be the most annoying character I have come across since the vicar Mr Collins in Pride and Prejudice by Jane Austen. He just invites himself to Heathcliff's house and expects hospitality on every visit, even though no one has ever invited him. His second visit involves an impromptu sleepover that practically had him running out of the house as dawn crept into the world. It was hilarious and I couldn't help but feel he got his just desserts. I did not like Lockwood from the start and I worry about how I will find his company through the rest of the book. 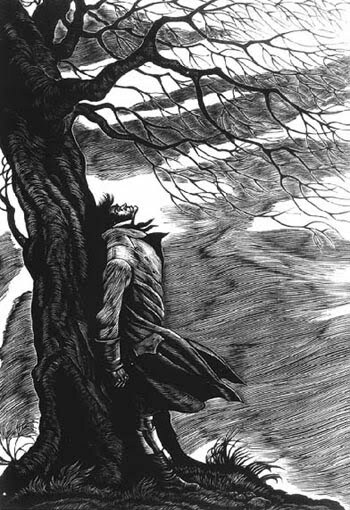 Heathcliff comes across as frightening and boorish, but not unlikeable. The farm comes across as colourless and frightful, definitely not one for my next English holiday. I wasn't expecting to smell a gothic aroma filled with ghosts and ghouls. I wasn't expecting to find Cathy as a ghost. That really shook me up. Not to say I didn't enjoy it, it just wasn't what I was expecting. I found the first three chapters very dark and coldness seem to seep into my bones out of the pages of the book. I could hear the branches of the trees brushing against my window and the wind howling around the house. I was there in mind and spirit, attempting to sleep in a haunted room. I found the first three chapters did confuse me a little. Catherine was referred to by numerous names and it took me a while to realise who she was and that she was dead. Also there were a number of characters that I had never heard of and some of their vocabulary was a little too archaic for my liking. I came away from the first three chapters, curious as to what has happened to Catherine and definitely wanting to know more about the history of the property. I can't wait to read on. It sounds like we had very similar reactions to the first three chapters. I love your comparison of Mr Lockwood to Collins!! I read this and don't remember it at all but I think it would probably come back to me because already from reading your post it is more familiar. I wish I had the time to wuther away with you all right now. This would be fun to read while everyone else is posting their thoughts. I didn't know you were doing the WH readalong! I remember those first three chapters and remember thinking wow I might actually like this book but it didn't turn out that way by the end...I hope you like it far better than me!!! How lucky you are to be reading Wuthering Heights which I think is a marvellous novel. I remember thinking that it was more gothic that I was expecting as well. Happy reading with the rest of it! Andreea - I am definitely enjoying it so far. I hope it stays that way. JoAnn - but Lockwood was so similar to Mr Collins. I couldn't stand him in the book. Debi - this is a whole new thing for me. I have only ever done one other readalong, but we weren't publishing our thoughts as went along. I like doing it this way. Nicole - It is like being part of a book club, which is something I would love to do. I may need to nag my fellow readers who live near me to make up our own book club. Amanda - I am sure I mentioned it, but maybe I didn't. I am slightly disorganised and forgetful at the moment. I am sorry to hear you didn't enjoy it. I hope I don't get disappointed as the story goes on. Hannah - I really wasn't expecting the gothic feel at all. I had thought it was a love story. A bit like Rebecca by Daphne Du Maurier. I thought that was a love story too, how wrong was I! lol! I wasn't a fan of Lockwood either; he's such a prig. I confess to never having read this book - have seen most of the tv adaptations though if that counts. The worst was actually a film version with Cliff Richard. I wasn't too crazy about this book back when I read it (but I was 15, so I should try again). Still, I'm glad that 1933 copy is getting read at last! I knew even less than you about the plot if you can imagine! As such, I am greatly confused by the first three chapters but am looking forward to more. How great is this.. I wish I had heard about Softdrink's readalong sooner and I might have joined. I tried to read WH years ago and failed miserably but I'd love to give it another go. I love the Lockwood/Collins comparison, although I find Mr. Collins a little more irritating --there's something very weasel-like about him. The first time I read this book I found the first three chapters very confusing too, but am just loving it now. This is a favorite of mine. I agree, Lockwood is annoying. It's very true, Heathcliff is frightening. I wish I had heard about the readalong, I would have joined.